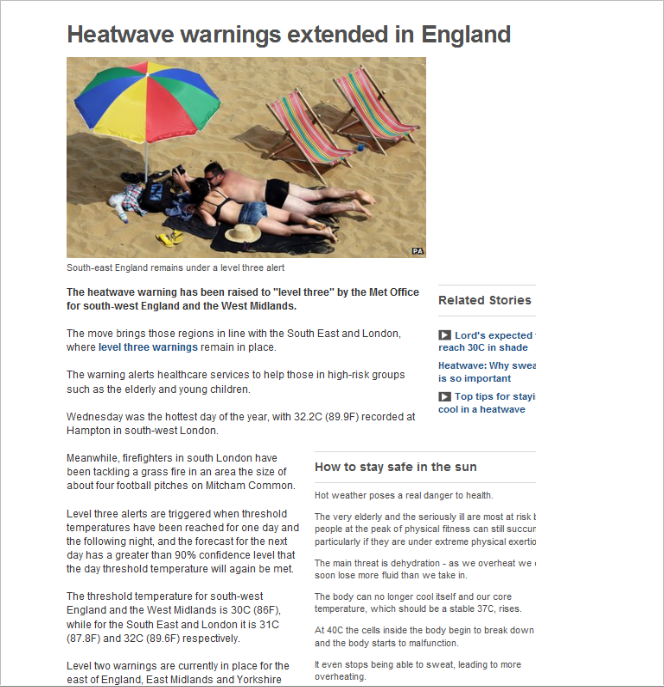 An article published in BBC News UK last July 18 reported that the Met Office raised the heatwave warning to level three in south-west England and the West Midlands. A level three warning is issued when threshold temperatures for one or more regions have been reached for one day and the following night. This stage can be dangerous for the health of the elderly and very young children, and could also lead to water pipe failure, which would require the services of a plumber from Bristol and other towns. July 17 was the hottest day of the year for Hampton in south-west London with a recorded temperature of 32.2 degrees Celsius. With six consecutive days of temperatures above 30 degrees, this year’s heatwave is the UK’s first prolonged period of excessively hot weather since 2006. In fact, several parts of the country namely the East of England, East Midlands, and Southeast England are, likewise, expected to be affected by high temperatures, and are in the “alert and readiness” category. Public Health England (PHE) officials advised people to stay cool by keeping themselves hydrated, seeking shade as necessary, and avoiding too much sun exposure. Moreover, members of the PHE heatwave planning team encouraged local authorities and healthcare organisations to remain vigilant. Unfortunately, heatwaves aren’t just detrimental to your well-being, but could also damage homes and other properties, specifically aging water pipes. During extremely hot days, dry soil shrinks away from buried pipes, making them vulnerable, even as increased water usage could raise the internal pressure to dangerous levels. When this happens, old pipes may shift and become susceptible to bursting. To prevent water interruptions and skyrocketing water bills, which could only make dealing with the heatwave more difficult, you should get in touch with leading plumbers in Bristol like the staff of SWN Plumbing who can thoroughly inspect and repair any deficiencies in your home’s plumbing system. Leaking pipes can waste a serious amount of water, which is an essential commodity in times like these. If you notice signs of leaking pipes, such as water stains on walls or ceilings, presence of a musty, damp smell, and an unusually high water bill, have them repaired immediately to avoid exacerbating the problem. You wouldn’t want to face costly water damage at a time when you might be feeling faint and weak from the heat. Although groundwater and reservoirs are full after England’s wettest-ever year (2012), water companies and government officials still encourage everybody to conserve water. You can start by turning off your faucet when brushing your teeth, and taking shorter showers instead of baths. With your own efforts and the help of skilled plumbers in your area, you’ll be able to protect your health, home, and the environment.